I'm a beginer, and the other day i found a coin that says its a two shilling coin, and i dont know what it is worth but i know that it it very cool that i found it in oklahoma. 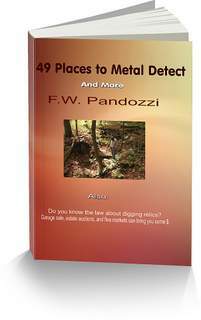 I've allways been a treasure hunter of sort, and now that i have a metal detector, i love it, it is very relaxing and exciting. well thats all from the beginer. I went out the other day and found two old military bullet caseinga and a rifle band off of a military rifle from back in the 1800s. i was detecting in a place where there was a military regimant for the Oklahoma land run, in the 1800s. this is a very awsome hobby, and i just cant get enough of it. Too bad a guy cant make a living doing it!!!!!!!!!!!! Mark, thanks for posting your story. Can you post a picture of that coin? Maybe we can help you better identify what it is and it's worth. If you have trouble posting it, then attach a picture in an email to me at detector99@yahoo.com, and I will post it at your story. Keep it up with the detecting, your off and running now. Hey every one, i had a neck surgery, and have to go on disability, but it wont stop me from my love metal detecting. The latest find for me was a watch fob, from the 1800's, and a old stage coach harness buckle, it came from Caldwell Kansas, where thew last stage coach station was, they are in bad shape but it still was very exciting, to find them.